The best Indian wedding photographers know that even the smallest details are important elements of any South Asian wedding. Things like mendhi, bangles, bindi, makeup and a lengha or sari all combine to create dazzling images. Even the intense gaze of a bride can be an important detail in the coverage of a wedding. This Sikh bride's wedding was made even more beautiful by the lovely orange color she chose for her wedding outfit. I created this image just outside the bride's house, shortly after the sun came up, on her parents' front porch. 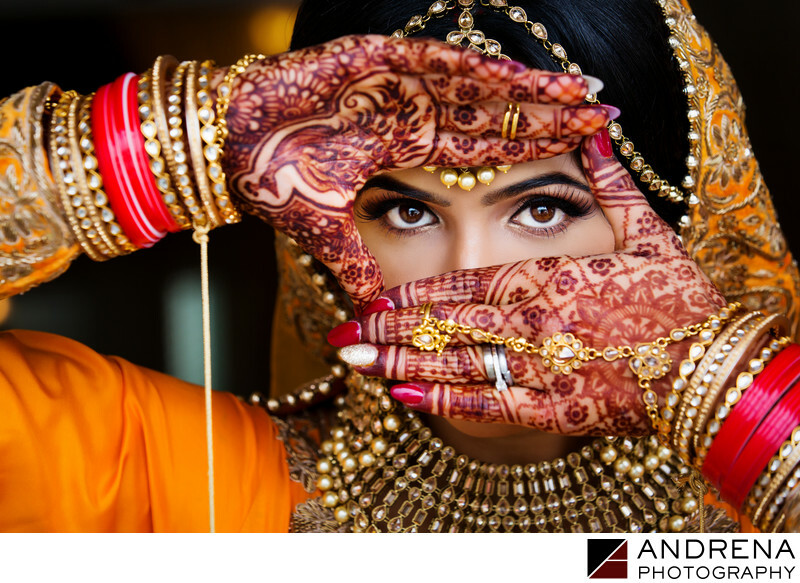 The end result is a beautiful portrait that highlights the bride's beautiful eyes as well as her mendhi and fingernails.